The expert therapists at Magee at Oxford Valley offer rehabilitative care for a variety of conditions, from the simple to the complex. Our goal is to help you achieve the highest level of independence within your home and community. New patients are typically seen within 48 hours and provided a comprehensive evaluation and treatment plan. Evening hours are available. Pictured (from left to right) is Siona Zellis with her mother, Sheryl, and physical therapist Lynn Cunningham. At just 24 years old, Siona Zellis has endured more than a lifetime of surgeries, doctor’s visits and therapy sessions. But a life-changing accident four years ago and a very special relationship with a physical therapist also helped her discover her career. In fall 2012 Siona was living in Brooklyn, NY. She had her own apartment, worked as an assistant in a preschool during the day, and took college courses at night. It was a full, busy, and independent life. One night that January, she was talking with a friend outside her apartment. Two cars crashed in an intersection, and one slammed into Siona as she stood on the sidewalk. The impact caused a severe degloving injury to her right leg. Siona had nine surgeries at three different hospitals before arriving at Magee. When she got to rehab, Siona was hurting both physically and emotionally. Bedridden for weeks and unable to take care of herself, she felt incredibly vulnerable. But one day in the therapy gym, Siona describes an awakening. After about a month, Siona transitioned to outpatient therapy at Magee Oxford Valley, close to her parents’ home in Bucks County. My goal at that time was to improve my walking,” recalls Siona. I had come out of Magee dependent on crutches. 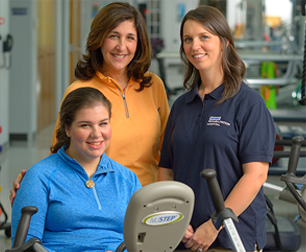 I needed overall conditioning and strengthening.” Siona’s mom, Sheryl, accompanied her to rehab. Siona’s physical therapist at Magee Oxford Valley was Lynn Cunningham. Lynn specializes in treating not only routine conditions, but complex cases such as Siona’s. Siona remembers Lynn not only being an excellent therapist, but an understanding and supportive friend. “I was in a pretty vulnerable state,” she says. Siona’s mom, Sheryl, accompanied her throughout her rehab. As an occupational therapist herself, Sheryl immediately felt comfortable with Lynn’s care. From a professional perspective, Sheryl has an advantage in understanding what is important in therapy, such as a background in rehabilitation in an inpatient setting, like Magee. Sheryl was so impressed with Lynn and Magee at Oxford Valley, that when it came time for her own physical therapy from a knee injury, she chose to go there as well. It wasn’t until 2015, at almost 21 years old, that Siona was ready to try college again. But now she knew for sure what she wanted to do with her life. She enrolled in an Occupational Therapy Assistant program at Eastwick College. She graduated in December 2016 with a 4.0 GPA and received her class’ merit award of excellence. She was also asked to speak at the ceremony. In January 2017, she passed her OTA boards. But she wasn’t done with therapy yet…Siona’s latest challenge was a tendon transfer surgery in June 2017. She’s back in therapy at Magee at Oxford Valley, hoping to regain her strength and walk independently. Lynn has confidence that Siona will achieve her goals. Fill out the form below and a representative from Magee at Oxford Valley will get back to you.